If you have ever visited Japan, and sat at the window of a departing flight, you should take a look out of the window after being pushed back from the gate. When you are pushed back from the gate, the ground crew unhooks the tow and makes sure everything is clear. You can then see them do something very Japanese. They start to wave as you start to depart and when the plane has just left their work zone, they bow to you. I know that at several other airports the ground crew will also wave, but I have yet to see them bow. I also rarely see more than one or two people do it. The Japanese ground crew all wave good bye and bow every time and I always feel a little sad when I see this as I’m leaving Japan but it makes me love Japan even more. The little things really add up. Make sure you look out the window next time you leave Japan. 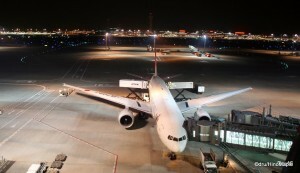 This entry was posted in Japan, Planes and tagged Airplane, Airport, All Nippon Airlines, ANA, Flight, gate, Haneda, Haneda Airport, JAL, japan, Japan Airlines, Narita, Narita Airport by Dru. Bookmark the permalink. I didn’t know this! I mean, I know about the bowing, but not that even tarmac crews do it. I regret not mentioning that it is almost always for JAL flights. Never been on an international ANA flight and never had a window seat for another airline. Maybe someone else can confirm it. I always fly ANA to Matsuyama, and I see them bow to us. So, it’s not only international flights. I try to wave them back. I don’t know if they can see me, but to show them my appreciation.